Fifty years after the creation of the Fifth Republic, French politics is undergoing profound changes. The election of Nicolas Sarkozy has announced a general review of the French political system. A special committee – the comité constitutionnel – is currently drafting a catalogue of potential reforms. Debates focus on issues like presidentialization, parliamentary scrutiny of the executive or the creation of a popular initiative to trigger constitutional review of given legislative texts. These discussions reflect long-standing trends in the Fifth Republic. This volume aims at analysing those trends and at outlining the major perspectives for future development. 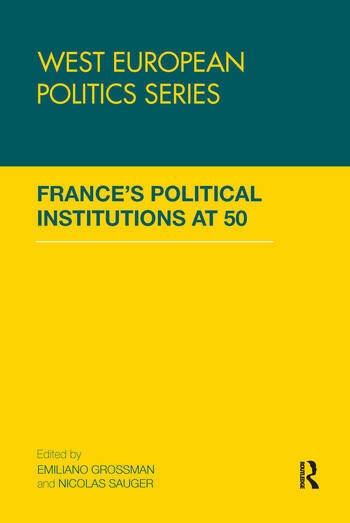 In particular it puts the French political system in comparative perspectives and provides in-depth analysis of the evolution of the major political institutions and their relations. The volume argues that substantial reforms have helped to partially reshape French politics. Yet, it also shows that the fundamental characteristics of semi-presidential government have stood firm. The question is whether current debates and subsequent reforms are likely to alter the current pattern. This book was published as a special issue of West European Politics. Emiliano Grossman and Nicolas Sauger are both senior research fellows at CEVIPOF / Sciences Po and lecturers at the Institut d’Etudes Politiques de Paris. Grossman’s research concentrates on economic interest groups and political institutions. Sauger has specialised on political parties and electoral systems. Their work is published in journals like the European Journal of Political Research, the Journal of Common Market Studies, the Journal of European Public Policy, West European Politics or the Revue Française de Science Politique.